Context: Yoga improves physical and respiratory functions in healthy inactive middle-aged people. Aim: This study aimed to assess the effects of 8 weeks of asana and asana with pranayama lessons in order to clarify the influence of two different combinations of yoga practice on physical and respiratory functions in healthy inactive middle-aged people. Subjects and Methods: A total of 28 participants (mean age: 52.7 years) were divided into a yoga asana (YA) group and YA with pranayama (YAP) group. Participants attended a 70-min session once a week for 8 weeks. The YA group practiced basic asana without specific breathing instructions, while the YAP group practiced basic asana with specific breathing instructions (pranayama). Respiratory function was measured with an autospirometer. Physical function assessments included the 30-s chair stand test and upper and lower extremity flexibility. All tests were assessed at baseline and after 8 weeks of intervention. Statistical Analysis: Changes in scores were analyzed with the paired t-test for each group. Pre-post results were compared for all the measured values. P < 0.05 was considered statistically significant. Results: Both groups showed significant improvements in physical and overall respiratory functions after the 8-week yoga intervention. However, the maximal inspiratory pressure and lower extremity flexibility improved only in the YAP group. Conclusions: The 8-week yoga intervention for healthy inactive middle-aged people improved the overall respiratory and physical functions, and the inclusion of pranayama had the added benefit of improving inspiratory muscle strength and global body flexibility. Yoga is an ancient Indian practice for bodily, mental, and spiritual communion. It was introduced by Swami Vivekananda in the United States in 1893, and from then on, yoga practice shifted toward the aims of attaining health, beauty, and body therapy, thus initiating the modern yoga age. As modern yoga increased in popularity, its use shifted to mind and body practices. Standard yoga usually combines asana (posture), pranayama (breathing), and meditation, with 89.9% of yogis using pranayama and about half (54.9%) using meditation combined with asana. Asana involves whole body movement, which consists of multi-joint stretching and strength-building motions of varying degrees of difficulty and other fitness-based exercises. Pranayama requires voluntary control of respiratory muscles and involves different breathing speeds, shortening and elongation of breathing, and breath holding via three phases: Puraka (inhalation), Kumbhaka (retention), and Rechaka (exhalation). According to McCall, yoga research has been conducted in the context of various health conditions, such as stress/anxiety, pain, depression, cardiovascular disease, blood pressure/hypertension, respiratory conditions, cancer, and diabetes. Moreover, the role of yoga has slowly expanded from complementary and alternative medicine to performance enhancement. Yoga is used to improve physical function (e.g., flexibility) and body coordination through asana, which has similar components such as stretching and strengthening exercises., Given its familiarity and similarities with traditional stretching movements, asana is used more often in general exercise regimens, but pranayama, which is typically used in standard yoga practice, is not widely used in fitness and sports. We hypothesized that, by adding pranayama to asana, respiratory function would improve and lead to enhanced physical function. However, no such studies have been conducted to date. Accordingly, this study aimed to assess the influence of asana and pranayama on physical function by targeting healthy inactive middle-aged people. Healthy nonsmoking volunteers were recruited through flyers, social networks, and family members and friends of current customers at Kyoto MBM Labo (Kyoto, Japan). Inclusion criteria were as follows: (1) age between 40 and 60 years and (2) able to take yoga lessons once a week for 8 weeks. Exclusion criteria were as follows: (1) previous extended period of practicing yoga, (2) a history of surgery of lower extremities, and (3) a history of being diagnosed with or treated for cardiovascular and respiratory disorders. A total of 28 volunteers (2 males and 26 females; mean age: 52.7 years) formed the final study population. This study was performed in accordance with the Declaration of Helsinki and was approved by the Ethics Committee of the School of Comprehensive Rehabilitation, Osaka Prefecture University. We explained the objectives and significance of the study to participants and obtained oral and written informed consent prior to enrollment. Participants were listed alphabetically and assigned numbers. Participants with odd numbers were allocated to the yoga asana (YA) group (mean age: 51.9 years ± 7.2 years; n = 14, 1 male and 13 females), and participants with even numbers were allocated to the YA with pranayama (YAP) group (mean age: 53.4 years ± 7 years; n = 14, 1 male and 13 females). Participants were further divided into two different time groups each (n = 7) to accommodate the studio size. All participants attended a 70-min session once a week for 8 weeks and were also recommended to complete home exercises at least twice a week by following instructions in the provided DVD during the study period. They were told to continue with their normal lifestyle during the study. Lessons were taught by an instructor who studied and trained in Iyengar Hatha Yoga for 20 years in the United States and Japan with professional credentials as an athletic trainer. The instructor is recognized by the American Medical Association as a health-care professional in the United States. The YA group only practiced asana, which was broken down to simple movements in the first session and increased in complexity, difficulty, and holding time as lessons progressed [Table 1]. 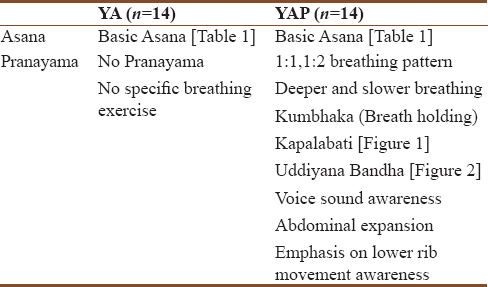 In contrast, contents for the YAP group consisted of basic asana with a similar sequence to the YA group, but with additional specific breathing instructions (1:1 and 1:2 breathing pattern, deeper and slower breathing, and breath holding, referred to as Kumbhaka). Breathing practice was conducted using participants' own voice and sounds to increase the awareness of their own breath length, strength, and speed [Table 2]. In addition to breathing awareness instructions, pranayama practice (either Kapalabhati or preparation of Uddiyana Bandha) was included in the YAP lesson. Kapalabhati is a cleansing technique [Figure 1], that aids in the clearing of air passages and reduces tension and blockage in the chest. The technique requires quick rapid pumping of breath muscles, especially the diaphragm, in order to achieve forced exhalation from the lungs, followed by rapid but passive inhalation. In this study, Uddiyana Bandha, an abdominal contraction method with external breath retention, was used to facilitate abdominal muscle contraction [Figure 2]. Home exercise DVDs consisted of four exercises of approximately 7 min in total for each group. Home exercises for the YA group included four basic asana exercises, while those for the YAP group included two basic asanas and two conscious breathing exercises. Each participant underwent pre- and post-measurements a week before the first lesson and a week after the last lesson. Inbody 430 (InBody Japan Inc, Tokyo, Japan) was used to measure weight, muscle mass, body fat mass, and body mass index for basic body composition. For muscle endurance and balance, the 30-s chair stand (30CS) test was performed for three trials and the average value was taken. Resting heart rate was taken for 30 s before the test. Participants stood in front of a chair and were instructed to squat down to sit and then to stand back up as quickly as possible for as many times over the course of 30 s. Arms were folded across the chest during the test. There was a 1-min rest period between trials. After three trials of 30CS, heart rate was taken again for 30 s.
To test flexibility, the back scratch (BS) test for upper extremities and the chair sit and reach (CSR) test for lower extremities were used. For the BS test, participants were asked to bring one arm over the shoulder and the other arm from below behind their back to assess the distance between two hands. The distance between the two closest fingers of the two hands was measured. The average of two trials for each direction, i.e., the right arm from the top and the left arm from the top, was used. For the CSR test, participants sat on the edge of the chair. One foot remained flat on the floor, while the other leg was extended forward with the knee straight, heel on the floor, and ankle dorsiflexed at 90°. Participants placed two hands together with middle fingers aligned, and after inhalation, they bent forward smoothly with exhalation at the hip toward the toes with their back straight and head up. While participants held the reach for 2 s with knees straight, the distance between the tip of the middle finger and the closest toes was measured. When the fingertips just touched the toes, the score was 0. If the fingertips did not reach the toes, a negative score was assigned. If the fingertips went passed the toes, then a positive score was assigned. Two trials were performed for both sides, and the average score was used. For both the BS and CSR tests, the average score of two trials for each side was determined separately, followed by addition of the average scores from the left and right sides. This score was used to reflect upper and lower body extremity flexibility. Respiratory function and respiratory muscle strength were measured using an aeromonitor (AE-300S, Minato Medical Science, Osaka, Japan) and autospirometer (AS-507, Minato Medical Science, Osaka, Japan) in the seated position. The testing was administered by a licensed physical therapist specialized in the respiratory rehabilitation field. Participants were first instructed to exhale maximally and then inhale maximally before forcefully exhaling into the autospirometer. To obtain accurate results, participants were instructed to pinch the nose with fingers and purse their lips to completely seal the mouthpiece. Means and standard deviations were calculated for all measurements for each group. Statistical analysis was performed with SPSS version 25.0 (IBM Corporation, New York, USA), and baseline data were analyzed using the unpaired t-test. Using all the available data from the 28 participants, changes in scores were analyzed with the paired t-test for each group. Pre-post results were compared for all the measured values. P < 0.05 was considered statistically significant. Baseline characteristics of both groups were similar, with no significant differences observed between groups in any of the primary variables (P > 0.05) [Table 3]. All the 28 participants attended all the eight lessons. For the 30CS test, the number of chair stands and heart rate after the test significantly increased in both groups [Table 4]. Both groups showed similar improvements in upper extremity flexibility with the BS test [Table 5]. On the other hand, significant improvements in lower extremity flexibility with the CSR test were observed only in the YAP group [Table 5]. For respiratory function, overall pulmonary function, which included vital capacity (VC), forced VC, forced expiratory volume, and peak expiratory flow rate, significantly improved in both groups. For respiratory muscle strength, maximum inspiratory pressure (Pimax) significantly improved only in the YAP group and maximum expiratory pressure (Pemax) did not improve in either group. Other respiratory parameters, including peak expiratory pressure (Pepeak) and peak inspiratory pressure (Pipeak), did not significantly improve in either group [Table 6]. The important findings of this study were as follows: (1) an 8-week yoga intervention targeting healthy inactive middle-aged people significantly improved physical and overall respiratory functions with or without pranayama and (2) only the group that added pranayama showed improvements in maximum inspiratory pressure and lower extremity flexibility. Consistent with several studies that have reported positive effects of asanas on physical function,,, healthy middle-aged participants in our study showed improved number of chair stands completed in 30 s and heart rate after the 30CS test. The completion of repetitive chair stand movements requires flexibility, as well as muscular strength and endurance of lower extremities. By practicing asanas, moving through different angles of joint movements contributes to the strengthening of muscles and flexibility. In addition, diaphragmatic stretching by yoga reportedly improves thoracic and abdominal cavity expansion, lumbar flexibility,,, body stability, balance, and expiratory muscle activity. Diaphragmatic breathing is facilitated by yoga, thereby influencing movement stability and overall respiratory function such that participants were able to withstand a higher activity load in the short term. In this study, merely practicing asana once a week was sufficient to alter the physical and respiratory status of healthy middle-aged people who had no exercise habits. Generally speaking, such people have reduced body mobility and flexibility, which can be reversed by physical exercise. This could explain why practicing even only asanas improved both respiratory and physical functions. Although practicing asanas with pranayama was as effective as practicing asanas alone in improving physical function, maximum inspiratory pressure improved only in the YAP group. Respiratory muscles, especially inspiratory muscle strength, play a significant role in muscle endurance. Previous studies have suggested the effects of inspiratory muscle pressure on high-intensity exercises,, and its effect on the change of perception of respiratory exertion during exercise., Improving respiratory muscle strength delays muscle fatigue and improves blood flow to peripheral muscles, thereby decreasing the sense of breathlessness., Thus, practicing pranayama over an extended period could potentially enhance respiratory circulation and contribute to adequate motor control, as well as bring about further positive changes in physical function. This study has several limitations. First, the study period was only 8 weeks, with yoga lessons being conducted only once a week. A previous literature review concluded that a minimum of 10 weeks, with pranayama practiced at least twice a week, was needed to observe changes in pulmonary function. Our participants were all new to yoga, including pranayama. The technique of pranayama and being conscious of one's own breathing take time to learn. Thus, the 8-week interventional period may not have been sufficient to examine the effects of pranayama. Nonetheless, improvements in various respiratory parameters were observed in both groups. A longer study period with more frequent lessons may have altered the outcome of this study. Second, the present study targeted inactive middle-aged people, so our findings may not apply to younger and more active people. Previous studies have reported that changes in respiratory function take longer in younger people than older people., Finally, we selected Kapalabhati pranayama in this study. Given that a different pace of pranayama might have different effects on physical function, studies involving a different kind of pranayama may be informative. An 8-week yoga intervention targeting healthy inactive middle-aged people improved overall respiratory and physical functions, and the inclusion of pranayama had the added benefit of improving inspiratory muscle strength and global body flexibility. We sincerely thank staff at Kyoto MBM Labo and participants in this study. Sincere appreciation to all researchers and yoga practitioners. Dinesh T, Gaur G, Sharma V, Madanmohan T, Harichandra Kumar K, Bhavanani A, et al. Comparative effect of 12 weeks of slow and fast pranayama training on pulmonary function in young, healthy volunteers: A randomized controlled trial. Int J Yoga 2015;8:22-6. McCall MC. In search of yoga: Research trends in a western medical database. Int J Yoga 2014;7:4-8. Bryan S, Pinto Zipp G, Parasher R. The effects of yoga on psychosocial variables and exercise adherence: A randomized, controlled pilot study. Altern Ther Health Med 2012;18:50-9. Gothe NP, McAuley E. Yoga is as good as stretching-strengthening exercises in improving functional fitness outcomes: Results from a randomized controlled trial. J Gerontol A Biol Sci Med Sci 2016;71:406-11. Sharm L. Benefits of yoga in sports – A study. Int J Phys Educ Sports Health 2015;1:30-2. Iyengar BK. Light on Yoga Yoga Dipika. Revised Edition. New York: Schocken Books Inc.; 1979. p. 19-53. Saraswati SS. Pranayama. Asana Pranayama Mudra Bandha. Munger, Bihar, India: Yoga Publication Trust; 1996. p. 361-403. Rikli R, Jones CJ. Senior Fitness Test Manual. 2nd ed. Champaign, IL, USA: Human Kinetics; 2013. Bal BS, Kaur PJ. Effects of selected asana in hatha yoga on agility and flexibility level. J Sports Health Res 2009;1:75-87. Polsgrove MJ, Eggleston BM, Lockyer RJ. Impact of 10-weeks of yoga practice on flexibility and balance of college athletes. Int J Yoga 2016;9:27-34. Tiedemann A, O'Rourke S, Sesto R, Sherrington C. A 12-week Iyengar yoga program improved balance and mobility in older community-dwelling people: A pilot randomized controlled trial. J Gerontol A Biol Sci Med Sci 2013;68:1068-75. Srinivasan TM. Dynamic and static asana practices. Int J Yoga 2016;9:1-3. González-Álvarez FJ, Valenza MC, Torres-Sánchez I, Cabrera-Martos I, Rodríguez-Torres J, Castellote-Caballero Y, et al. Effects of diaphragm stretching on posterior chain muscle kinematics and rib cage and abdominal excursion: A randomized controlled trial. Braz J Phys Ther 2016;20:405-11. Ankad RB, Ankad BS, Patil S, Chinagudi S, Shashikala GV. Effect of short term pranayama and meditation on respiratory parameters in healthy individuals. Int J Collab Res Intern Med Public Health 2011;3:430-7. Ahmed QR, Sau SK, Kar SK. 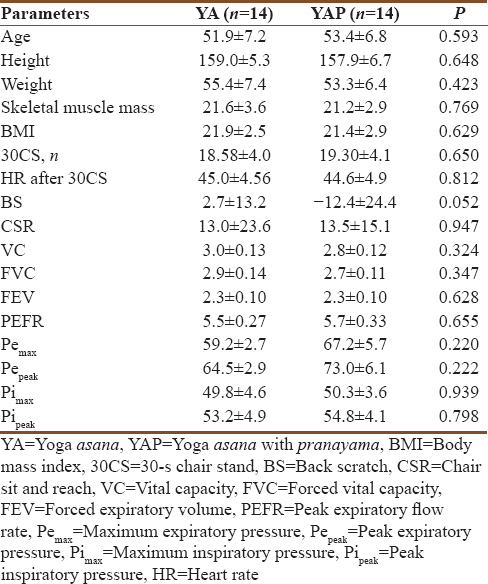 An evaluation of pulmonary parameters in two groups of subjects during yoga practice. Nepal Med Coll J 2010;12:180-2.
van der Esch M, van 't Hul AJ, Heijmans M, Dekker J. Respiratory muscle performance as a possible determinant of exercise capacity in patients with ankylosing spondylitis. Aust J Physiother 2004;50:41-5. Sasaki M, Kurosawa H, Kohzuki M. Effects of inspiratory and expiratory muscle training in normal subjects. J Jpn Phys Ther Assoc 2005;8:29-37. Witt JD, Guenette JA, Rupert JL, McKenzie DC, Sheel AW. Inspiratory muscle training attenuates the human respiratory muscle metaboreflex. J Physiol 2007;584:1019-28. Spengler CM, Boutellier U. Breathless legs? Consider training your respiration. News Physiol Sci 2000;15:101-5. McConnell AK, Romer LM. Respiratory muscle training in healthy humans: Resolving the controversy. Int J Sports Med 2004;25:284-93. Schoser B, Fong E, Geberhiwot T, Hughes D, Kissel JT, Madathil SC, et al. Maximum inspiratory pressure as a clinically meaningful trial endpoint for neuromuscular diseases: A comprehensive review of the literature. Orphanet J Rare Dis 2017;12:52. Bradley H, Esformes J. Breathing pattern disorders and functional movement. Int J Sports Phys Ther 2014;9:28-39. Tran MD, Holly RG, Lashbrook J, Amsterdam EA. Effects of hatha yoga practice on the health-related aspects of physical fitness. Prev Cardiol 2001;4:165-70.